Most kite trains that I make are constructed in basically the same manner. Similar materials are used, and construction techniques are the same. In the first section of this handbook I will give you the basic techniques for constructing any kite train. In the second section I will give you plans for my favorite kite train designs, dimensions and specific assembly instructions. Be sure you read the basic instructions before you begin to assemble any of the kite trains. I would like to remind you that these designs are, by no means, the only ones you can make. Literally any kite design or shape of kite can be made to fly in a train of kites, that is, more than one kite on a single line. Experiment with any design that you think might make a good train of kites. When you begin to build and fly kite trains your imagination begins to function in multiples of one. There is no limit to your imagination, or to the type of kite or the number of kites in a kite train. This handbook is dedicated to the memory of kite train maker Dave Debolt, without whose help and inspiration i would have given up on kite train flying many, many years ago. a.) Most designs use 1/8 inch wood dowel rods. After choosing a sail shape and a train design that you wish to make, you must construct a template out of cardboard, cut to the shape of your design. Cardboard is readily available, and is sufficiently durable for kite trains of 25-50 kites. Cardboard does tend to wear out, producing crooked edges. Use a piece of aluminum plate, if available, or a thick piece of plastic. Both will last longer and produce straighter edges and will help to hold down sail material as it is being cut. You should be able to cut out 2-4 thickness of material at a time, but you must hold the template and material firmly. It is suggested that you cut out all the sails before you go to the next step. If you plan to decorate the sails, do so at this time. NOTE: Think of kite train construction as an assembly line process. You will do all of one process for the entire train before going on to the next process. You will become more proficient at the processes after you do each one hundreds of times. Spar size and diameter is determined by the size of the kite and the expected winds the train is to be flown in. Remember that the sail must provide lift for the weight of the spar. The basic guideline for spar size is: 1/8 inch for up to 18 inch kites (2.5 sq. ft.) 3/16 inch for 36 inch kites (9 sq. ft.) and 1/4 to 1/2 inch for larger kites. If you use bamboo, you may want to bend it by passing it through a candle flame or steam. Caution and patience are required to bend bamboo using these methods. Trim the edges of the tape (Neatness counts, even in trains of hundreds of kites.) Ragged tape edges also catch tails and flying lines. Press and rub down the tape around the spars; this helps the tape to stick and looks neater. 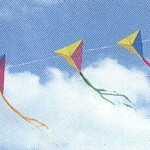 There are several methods for securing kites to the main flying line. If you plan to fly 50 kites or less in your train you can tie pieces of precut and premeasured line to each kite. Use this line to also tie the spars together. Tie them securely with knots that won’t slip. 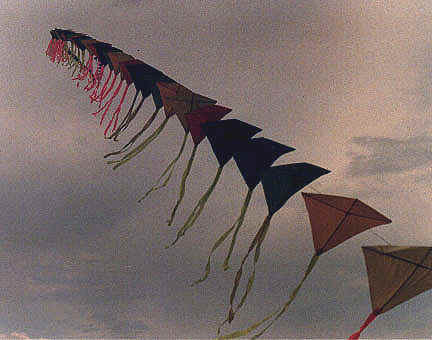 If you plan to fly more than 50 kites in your train, mark the selected flying line in about 3 foot intervals. ( Trains will fly at 3 foot, 5 foot or 20 feet apart, an arm’s length of 3-4 feet seems to work best and that length makes easier train retrieval.) Do not space the kites at less than their own height, as they do not fly well very close together (i.e. no less that 18 inches apart for 18 inch tall kites) From an artistic point of view kite trains look best in the air when the kites are closer together. Knots reduce main line strength by 40-50%. For 25 to 50 -18 inch kites use 200# test line. For 50 to 100 – 18 inch kites use 300# test line. For 200+ 18 inch kites use 400# test line. Al’s Line Strength Axiom: The strength of the flying line is in direct proportion to the VALUE of the kite train, not necessarily the pull. Breakaway kite trains ARE dangerous. SEE SAFETY SECTION. 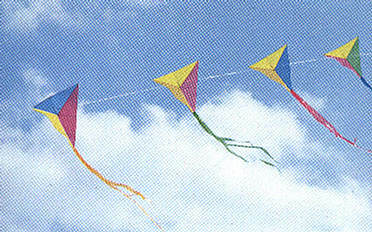 Tails provide stability for the kites in a train. The movement of the tails make up a large portion of the artistic appeal of a train. Use at least two to three times the height of the kite in tail length. Three or four small pieces are better than one larger one. Shorter tails tangle less. The length of the tails is suggested in each kite design in Section Two. Experimentation is required to match the length of the tails to your prevailing wind conditions and the artistic look you want for your train. You will need a container to store and transport your train in. The box will not only be for storage, but neatly arranged kites in the box will launch easier, with less tangling. Be sure not to have loose box ends or tape in the box that might snag kites as they are launched. NOTE: Some kite train fliers spend as much time and artistic energy in making the storage box for their trains as they take in the actual construction of the train itself. ALWAYS prepare an anchor for the train BEFORE you launch. A dog screw is sufficient for up to 50 kites in a moderate wind. For big trains (300+), choose a very secure anchor. Posts, hydrants, fences or other large secure objects make excellent anchors. NEVER UNDERESTIMATE THE PULL OF A KITE TRAIN, EVEN IN LIGHT WINDS. Simply feed out the top kite from the storage box and in moderate winds the kites will launch right from your hand. (5-8 mph is the best wind for most trains, size and shape of your kite may change this figure) In light winds feed out 15-20 kites down wind and have an assistant hold the top kite, take several steps backwards and the kites will usually become airborne. In heavy winds be careful so that the kites do not feed out of the box so fast that they are damaged. NOTE: Always wear gloves when flying a kite train. NEVER UNDERESTIMATE THE PULL OF EVEN A SMALL KITE TRAIN. Some train fliers use a large lift kite at the top of their train to ease in launch (of a different type than those in their train) The author suggests that you use a larger kite of the same shape and design as the rest of the kites in your train (i.e., use a 24 inch wide diamond kite to help an 18 inch diamond kite train). If you choose to use, say, a big delta instead, be prepared to explain away spectators’ questions about the “big” kite at the top that’s holding up all the rest of the train! Kite trains take up a lot of air space; consider this when you choose a flying site. Plenty of field downwind is preferable in case of an unexpected drop in the wind and the train comes down. Be aware of other fliers on the field. Once you anchor a train you cannot move it around easily or quickly. Talk to other fliers on the field about potential problems. Most will be very accommodating. Remember that if you have selected Kevlar as your flying line, you can and will cut most any other kind of kite line that tangles with your train. Be courteous and assist in untangling the other kite, even if it means bringing down part of your train. Location of the anchor point is very crucial when flying a train. You may have to move the anchor point several times before you become familiar with the flying characteristics of each kite train and with varying wind conditions. Most trains fly at a high angle, and should be anchored upwind of sport kite fliers, or to the sides of most single line fliers. Kite trains attract attention! Be prepared to answer questions about your kite train, that every spectator seems to ask. How many kites are there? Did you make them? How do you launch them? How strong is the line? 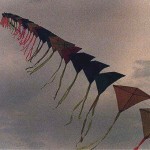 Sometimes there will be too much wind to fly a train of more than 25-50 kites. Try flying your big train in smaller sections side by side. Launch each train and anchor them about 20-25 feet apart. After observing how the way each train flies, move each anchor closer together. You can eventually have each train flying mere feet away from each other in a very spectacular display. Be very careful when you fly trains in this manner, one tangle can lead to hours of untangling. As with any strong pulling kite or kite train, you can use your train to pull a wide variety of spinners, windsocks and banners into the air. Trains have less tendency to react to gusts of wind and wind changes. Trains are spread out over a wider area of the wind and are better suited to being used as lifting devices. Try flying several different shapes of kites together in one train, or try different sizes of the same shape alternately in the same kite train. The variety of things for you to do while flying your trains is limited only by your own imagination. One of the most enjoyable things that you can do while your train is flying is to simply watch it weave and sway in the winds and marvel at its beauty, a masterpiece that you created yourself. An assistant is helpful in kite train retrieval, especially in heavy winds. The assistant packs the kites away as you pull them in. To assist in heavy wind retrieval, try securing a metal ring to the main flying line every 25 kites. You will then walk the train down from the anchor point to the first ring. Hook a strap into the ring and haul the train back to the anchor point, packing as you move along. When you get the ring to the anchor, secure the ring and repeat the process until the train is down. Snap clips are helpful in this retrieval process. NOTE: Always bring down a kite train BEFORE it gets too windy to retrieve it. Bringing a kite train down in light winds uses the same process only faster. When there is no wind, the train drops to the ground. There is “NO SECRET” that assistants seem to fade just as the winds did, when you are picking the kites up off the ground. – Never let anyone fool with the flying line or the anchor of a big train. – Select your anchor carefully. I have dislodged a fire hydrant with a 300 kite train. – Never allow anyone to pull slack into the main line. Fingers can get wrapped up in the line. – Always be courteous to other fliers on the same field. – Never fly near an airport. – Always use gloves when flying any size kite train. – Always be courteous to spectators on the field. – Periodically check the pull of a flying kite train. Be prepared to retrieve the train before the pull becomes too great. – Never anchor a kite train and neglect it. Be prepared for emergencies. – Inspect the flying line after each flight. Breakaways ARE dangerous. – Be careful of the “Numbers Game”. Launch only as many kites as “YOU” feel safe and comfortable with and can retrieve safely. As little as 15 years ago the World Record for the most kites on a single line was only 100 kites. As technology and kite train techniques have advanced so has the World Record. The current official World Record for the “Most Kites on a Single Line” is an AMAZING 10,567 12 inch by 12 inch kites, flown by Kazuhiko Asaba and the village of Kamakura, Japan in November of 1991. More kites than this may have been flown, but to qualify for the World Record you must retrieve, unbroken all the kites you launch. There is no limit to the kite train numbers game. The only limit is your imagination and ingenuity. You just might be the next World Record holder. Good luck and Good Winds. Several of the following kite designs and diagrams originally came from the book “Kite Train Making” by Eiji Ohashi. The dimensions have been changed, some measurements have been converted to English and personal modifications have been made to the designs, but without the work of Eiji Ohashi most of these trains would not have gotten off the ground. My personal thanks! Al Hargus has been flying kites for 22 years. His first homemade kite was a garbage bag sled made with the help of a friend. Al collects kites of any type, and his present collection numbers over one thousand. Al was first introduced to kite trains in 1982, when he attended the American Kitefliers Association National Convention in Detroit, Michigan. 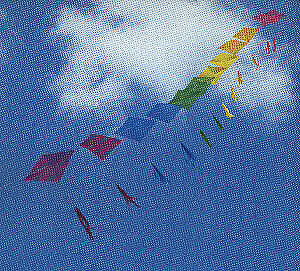 The late Jack Van Gilder’s delta kite train became an inspiration for Al’s many kite trains. Some of the trains he keeps, many he gives as presents and gifts. 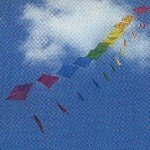 He presently has about thirty kite trains, from ten kites to his largest with over three hundred kites. He entered his first comprehensive kite contest in Columbus, Ohio in 1983 with a kite train of one hundred eddy kites. Al has won numerous awards with his kite trains at events across the country. He currently holds the record for “The Most Kites in a Train” in Illinois, Michigan, Ohio, Indiana and Pennsylvania. Al writes the “Tangents and Trivia” column in every issue of KiteLife.com.